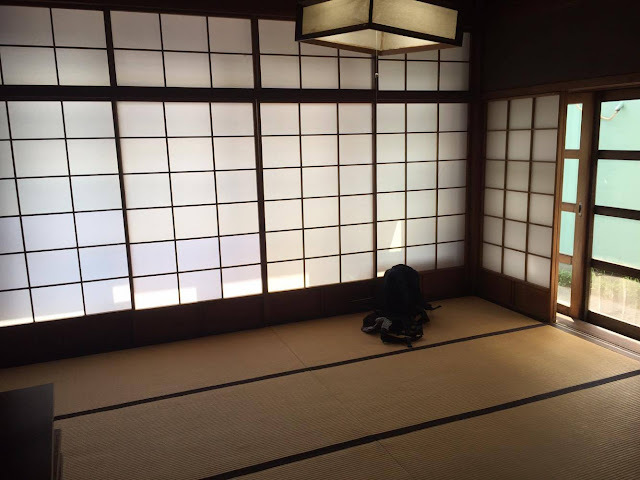 The Bohemian Sassenach: Scouting in Japan: Udon Noodles! This past Sunday, our Cub Scout Pack hopped a train to go visit our brother pack, Kiyose 3, for a fun day of making udon noodles & town cleanup. We are so fortunate to be able to share this amazing friendship which offers our boys cultural exchange opportunities. We try to meet up with our Kiyose friends once a month for something fun. I am always amazed at how easily children bridge the gap of a language barrier to connect with each other. Our friends met us at the train station & we divided all the boys into 2 groups for the walk to the community center we were using. On the way, the boys complete a small service project of picking up any trash along both sides of the road. It's about a 15 minute walk & we ended up with maybe 10 pieces of trash. 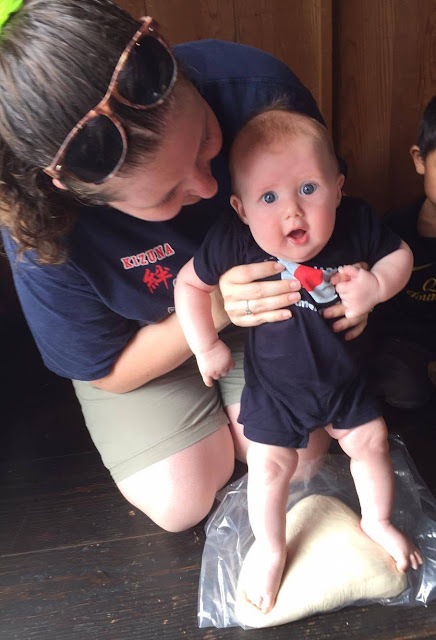 Japan is very eco-savy, but its nice to instill that sense of community involvement with our scouts. Fair warning.. lots of pictures ahead! 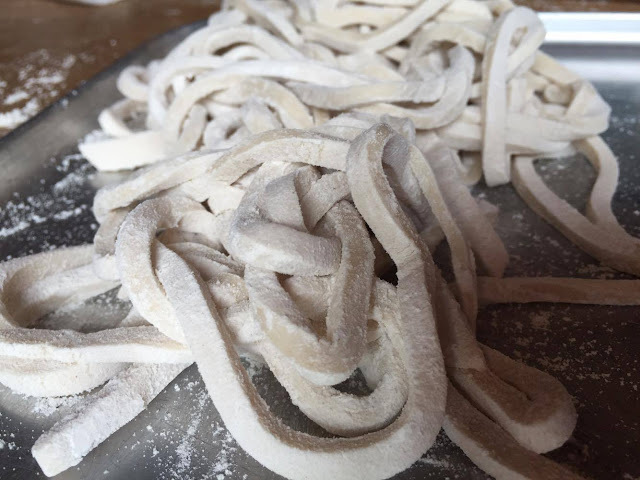 Udon noodle dough is really simple.. it's flour, salt, and a small amount of water. 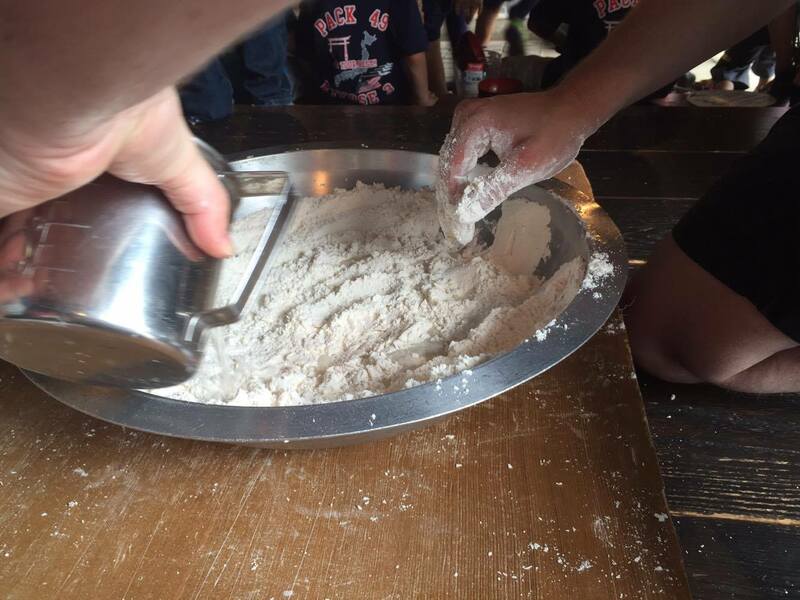 All of the scouts are divided up into groups to take turns helping make the dough. They all love this part, as it is very messy! Water is added in tiny amounts to the flour/salt mixture until a smooth dough is formed. After the dough is checked for consistency, the real fun begins! The dough is shaped into a round & then placed into a plastic bag. 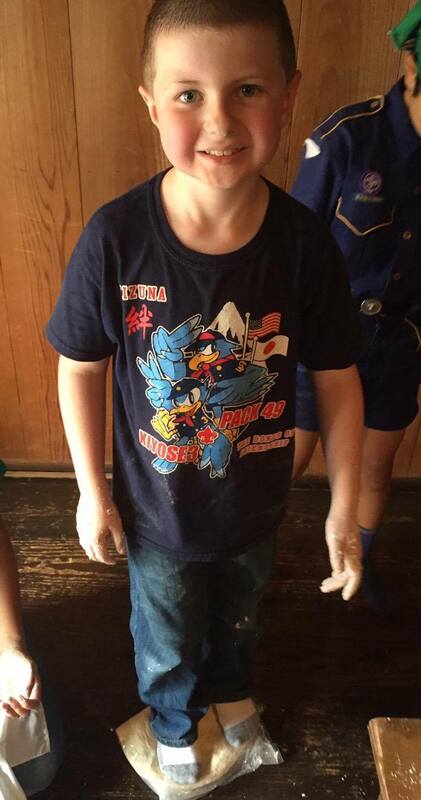 All the scouts take turns kneading the dough further... with their feet!! 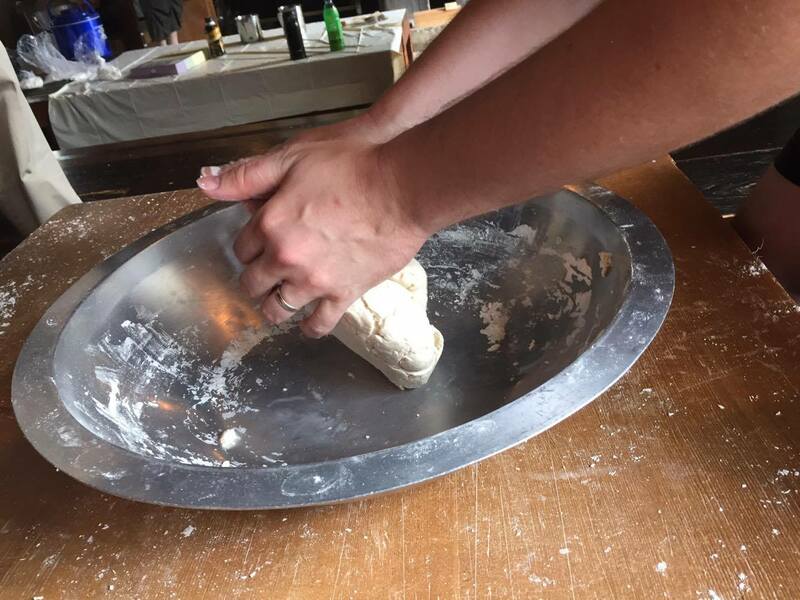 The dough is squished out flat, then folded up again, and the process repeats until the dough feels as soft as when you gently squeeze your ear lobe. Once done, the dough has to 'sleep' for a little while, so the boys were sent off to wash their hands & play while the grown ups tidied up a bit. The next step to noodles is rolling out the dough into a giant, thin rectangle. I love that everybody was encouraged to take a turn helping. 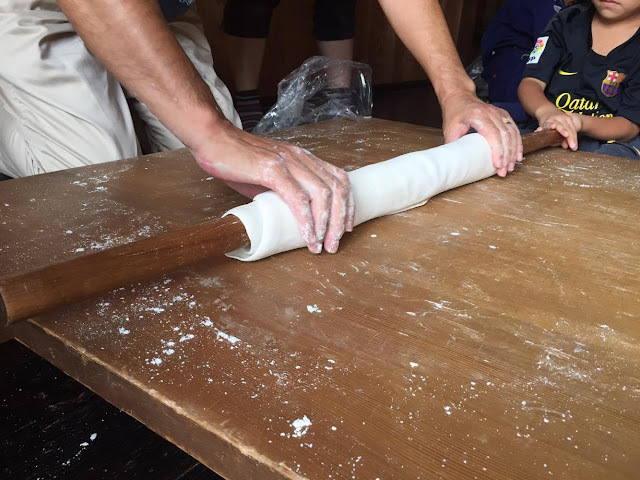 To help it roll a little faster, the dough is gently stretched as it is rolled around the pin. 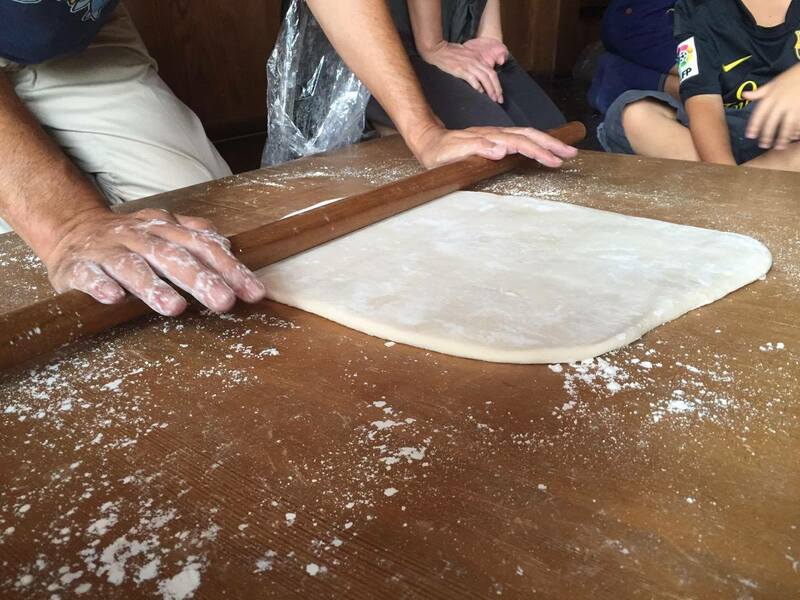 This actually takes a soft hand & skill.. if you're too rough, the dough will rip. 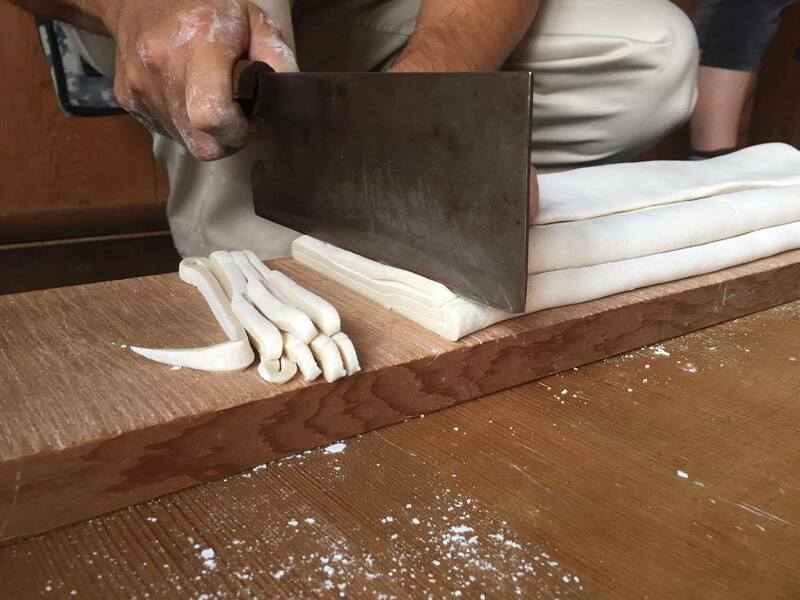 Finally the dough is folded back and forth across a small wooden board & then cut into noodles! 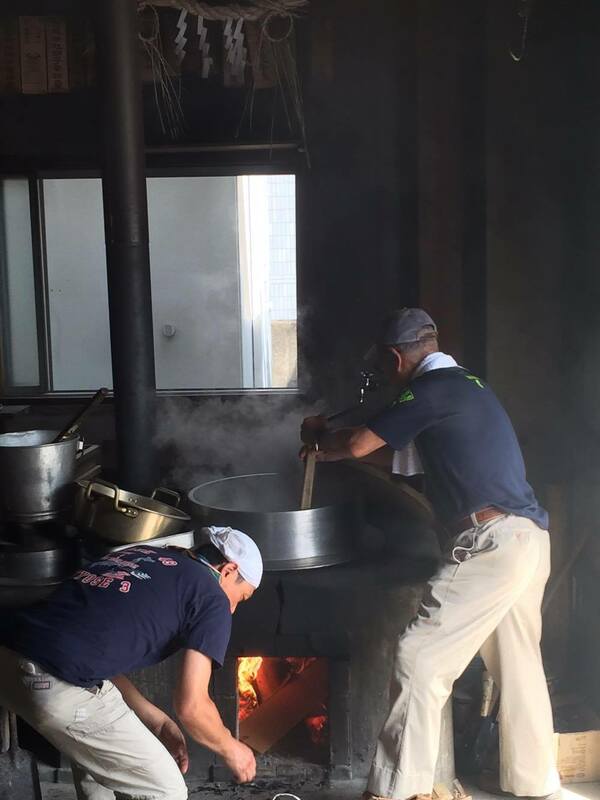 The cooking is done in a big pot over a wood fire. There is an attached spigot to add cold water as needed to prevent it from foaming over as it boils. It got very warm & smoky at this point, so Dragon & I took a break in a cute attached room with tatami mats. It was rather warm in there too.. but it offered a quiet space to feed & change the baby. I told my husband I would love to have a room like this in our "forever home"! ok, back to the noodles! Once cooked, the noodles were drained & set out on each table for everyone to share. Everyone got a bowl of broth with onions, tofu, & pork. 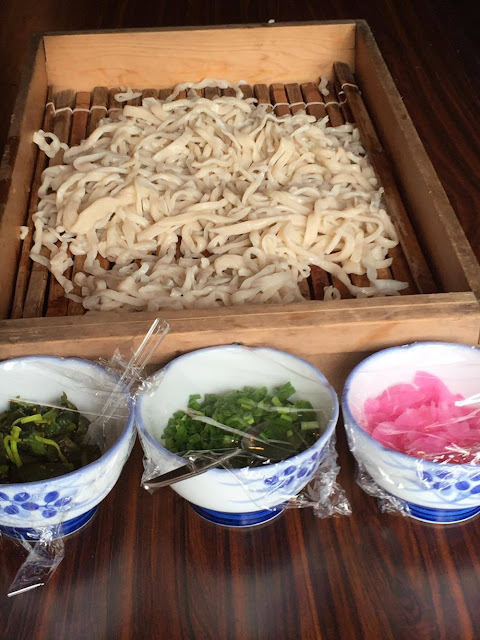 Other toppings were available such as green onion, japanese pickles, pickled radish, & nori (dried seaweed). The adults were offered additional choices of more onions & what i believe was nettle leaf. It was very earthy in flavor & slighty minty. Bubs dug right in & was definitely enjoying the fruits of his labor! We were also treated to japanese pear, which tastes like a cross between apple & pear. They are huge & delicious! I didn't get a picture, as all the adults had to act quickly before the kids swiped it all! 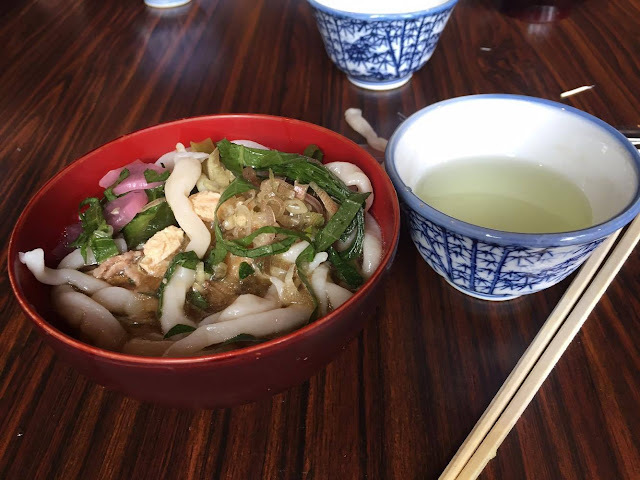 A bowl of homemade udon & a glass of cold green tea... heaven! 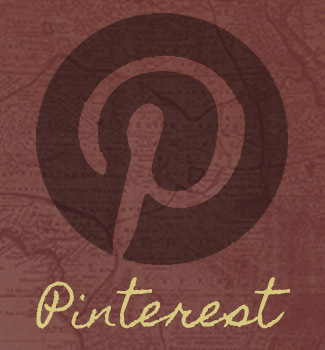 Stay tuned to see where our next scouting adventure will take us! What a fun project for the kids; looks yummy! 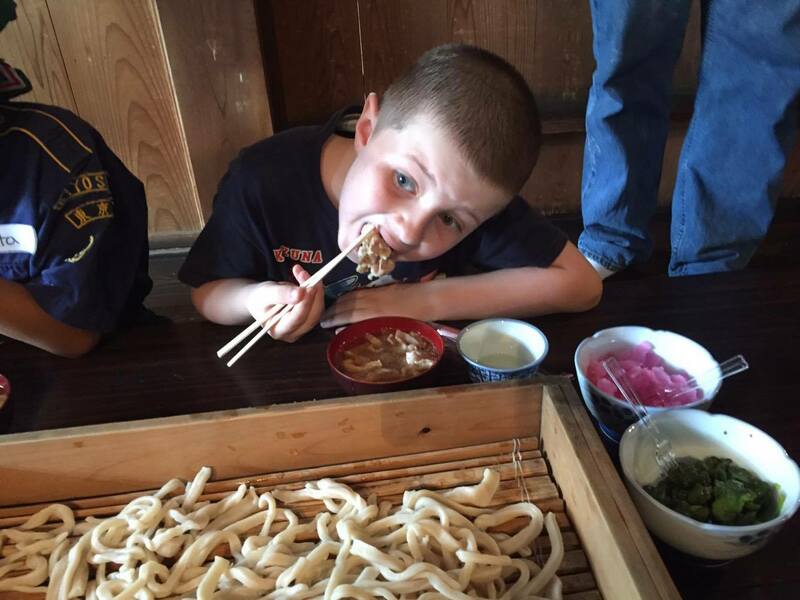 It was interesting to see the noodle making progress; thanks for sharing.